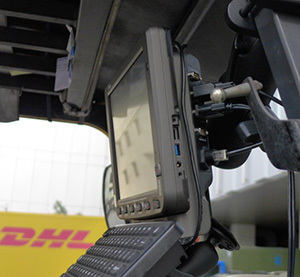 One of the world's leading logistics suppliers, has integrated Winmate's 10.4" FM10 Rugged Vehicle Mount Computer to its operations at their facility in Taiwan. The FM10 is reliable, durable, and designed to withstand the conditions found in industrial environments such as warehouses. The FM10 also comes equipped with continuous connectivity providing reliable communication between the equipped forklifts and the warehouse datacenter. By integrating Winmate products into their operations, this company has been able to maximize process efficiencies and streamline communication. To minimize human errors, rugged solutions must be able to read and transmit product identifications via a barcode or an RFID tag. Product tracking is paramount for inventory management, order fulfillment, asset tracking, and shipping and receiving. 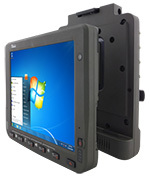 Look for devices that offer vehicle operators the ability to connect an external barcode reader via COM port or a keyboard via USB to speed up data entry and reduce errors. The best rugged warehouse solutions are designed specifically to fit seamlessly into forklifts and other warehouse vehicles with secure mounting. All cables should be secured inside the cab providing the driver with sufficient clearance to drive and perform other tasks unencumbered. Look for solutions that also offer a dedicated vehicle dock and can be quickly dismounted from the docking allowing the operator the mobility necessary to assist in monitoring and tracking inventory information in the warehouse. The most essential need of every supply chain operation is real-time tracking of the movement of goods from manufacturing all the way through to customer delivery. This keeps operations running smoothly and reduces lead-time and errors. A quality rugged solution requires reliable wireless connectivity to make this possible. Unlike consumer devices, the rugged solution must be robust enough to overcome interferences within the warehouse and the obstacle of distance in the case of large warehouses that can be the size of multiple football fields. 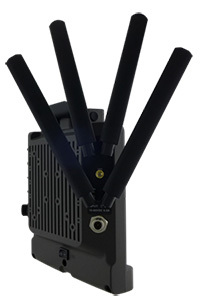 Look for devices that provide continuous connectivity and enhanced antenna options ensuring you a strong, reliable mobile connection and flawless communications that will keep your operation running efficiently.